Accouterments were as much a challenge to the military as uniforms. The proper balance between capacity, weight and accessibility was difficult to strike. 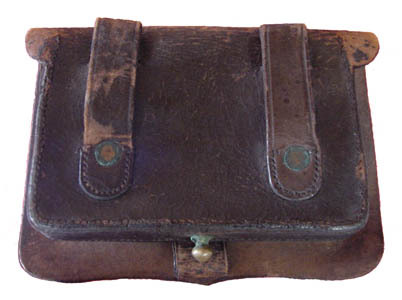 Prior to the Civil War the Army introduced a new pistol cartridge box. This might be worn by officers or enlisted men armed with pistols. Unlike their infantry counter parts cavalry troopers carried two cartridge boxes. One was for carbine and the other for the pistol ammunition. An additional issue for the mounted soldier was how to wear the box so as not to be in the way while seated on a horse. Therefore, the box was generally worn in the back, but moved around to the front while in use. Three packages of six rounds each were kept in the cartridge box. Each round consisted of a lead pistol bullet in the correct caliber for the pistol and a premeasured powder charge in a paper cartridge. The cartridge was load with the help of a loading lever ram rod build into the underside of the revolver. A well-trained soldier could reload a typical 6 chamber pistol in about one minute. A layer of grease was applied to prevent simultaneous discharge of multiple chambers of the cylinder. Colt revolvers were first acquired by the U.S. Army in 1847 and carried by mounted units in saddle holsters. 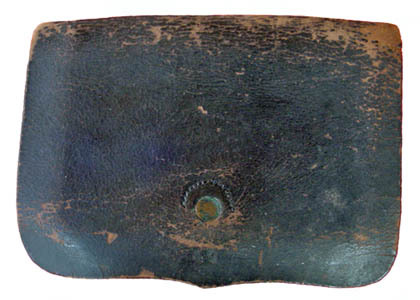 With the formation of U.S. cavalry regiments in 1855 and their use of .36 caliber Colt Navy revolvers, belt holsters increasingly came into use.